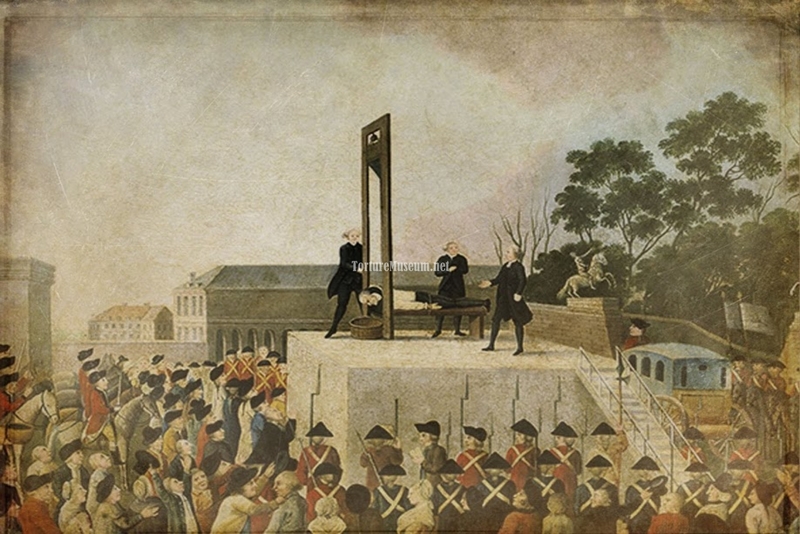 In 1791, the French physician Jean Guillotine proposed to reform the process of execution. 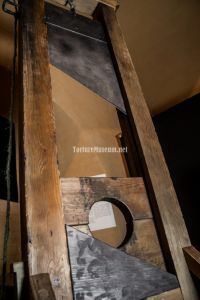 The goal of this proposition consisted of making beheadings not only a privilege of the nobles, in addition to also carrying out the process as quickly as possible in order to cause the least amount of suffering. 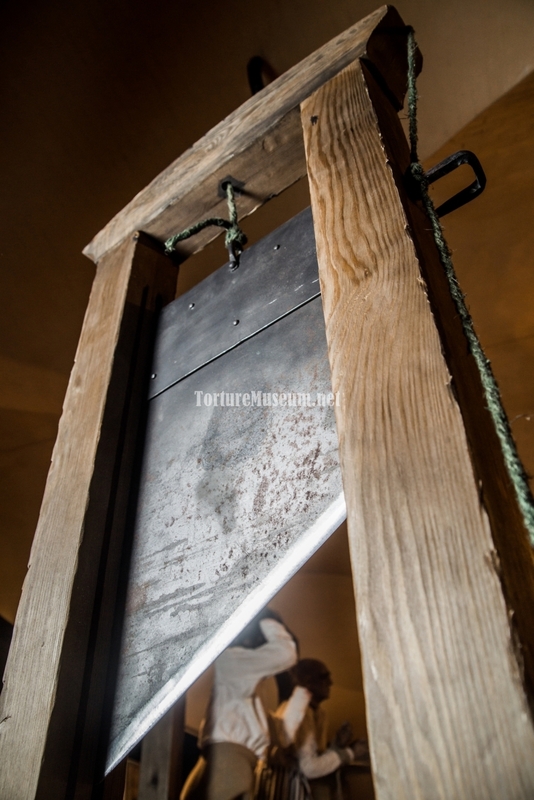 After all, in those days, death sentences involved the cruelest of methods: burning at the stake, hanging and quartering. Therefore, there in lay the guillotine. A special feature of the guillotine comes in the form of sharpening the blade at an angle with weights weighing 40-100kg, enabling it to move unhindered down its vertical runners. Executions were carried out as follows: the convict’s neck was pinned between two boards equipped with access holes, the body laid upon a wooden bench. After this, the latch holding back the knife is opened via lever mechanism, and the blade falls rapidly toward the victim’s neck from a height of about 2 – 3 meters. The severed head gets lifted and presented to the crowd of spectators. It is believed the offender can still perceive things with his eyes for another 10 seconds after decapitation. The design of this instrument allows for the death penalty to be carried out every 10 seconds, turning the process into a bloody conveyor belt. 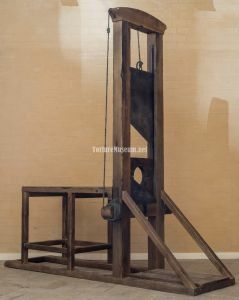 During the French Revolution, everyone charged with supporting the aristocracy was subject to immediate beheading, with the victims by means of Guillotine during the “Reign of Terror” numbering between 15-40 thousand citizens. 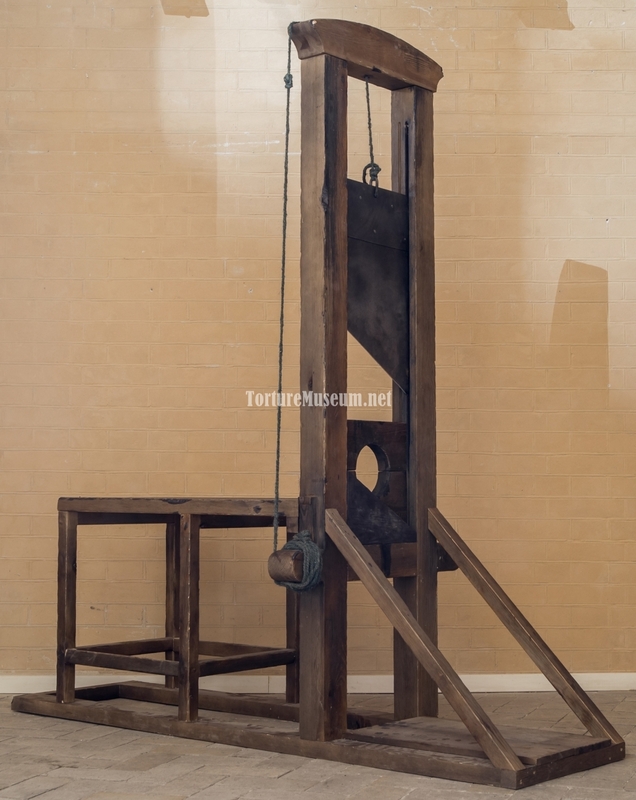 An interesting fact: The last execution by guillotine was performed in Marseille, during the reign of Giscard d’Estaing, September 10, 1977. The man executed was Hamida Djandoubi, of Muslim origin. Not only was it the last instance of the guillotine’s use, but also the last death penalty carried out in Western Europe. You knew this man? What can be done for him now — he’s a prisoner of the State. He’s been scheduled for a date with Her Majesty’s Guillotine. The sentenced man’s hands have been tied behind his back. His head is covered by a sack. The criminal requests that the sack be removed so that he may look his executioners in the eyes. They say that this is bravery, however it seems to me that to not see — that is even scarier. The executioner gently, but also very purposefully, helps the man onto the bench. The man’s self-control leaves him for the slightest moment and he tries to get up on all fours, only to fall once more onto the rough wood. The movable board silently slides up along the runners that have been greased with animal fat. This man they’ve arrested is now laid upon the polished semicircle by the scruff of his unshaven neck, and then immediately clamped down with the upper plank. For the next step, the hands of our morally defeated prisoner are hung through the borings on either side of him. A priest reads a prayer, but the condemned man doesn’t understand its meaning. His terror-stricken heart beats like a drumroll. There is a short command, and a merciless hand pulls the latch. It’s all over within a third of a second. The massive knife drops down and makes a muffled strike into the wooden platform. A fountain of blood sprinkles the boards. The space between executed man’s shoulders reminds one of a cross-section of some kind of exotic fruit. The man continues to neurotically clench his fists, but he is already without a head. The dexterous executioner snatches it out of the air, holds it by the hair, and presents it to the dumbstruck crowd. The headless body feels pain for another 10 seconds, and bulging eyespi still see. At least, that is what many say, but no one can know for sure.